A few weeks ago over Memorial Day Weekend, a couple of my girlfriends and I made the trek down to the Emerald Coast. 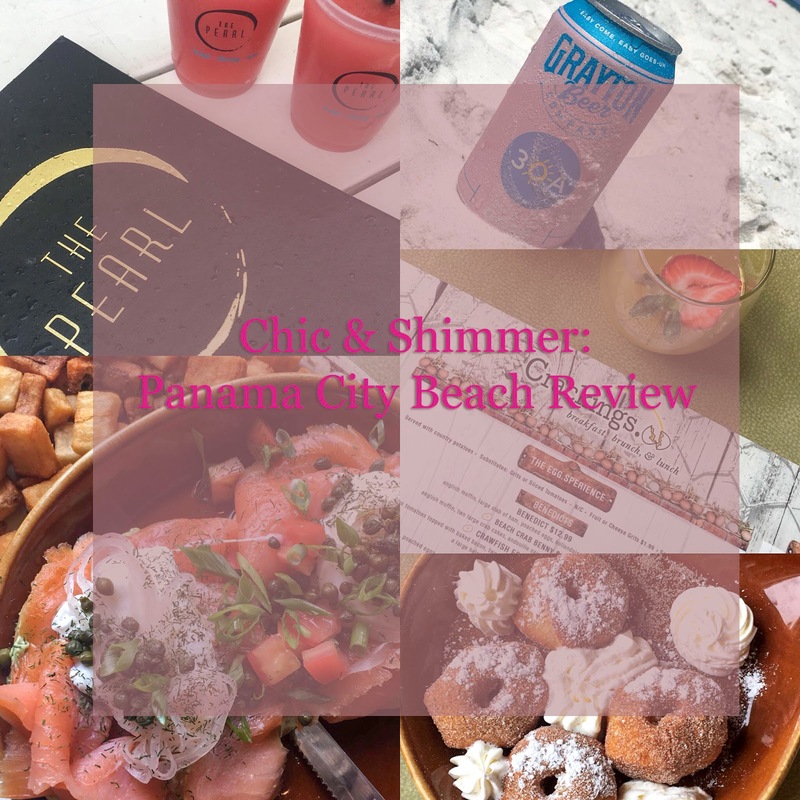 More specifically, we visited Panama City Beach. I've spent time in Destin & down 30A but never over to PCB so this was my first time! Let me just tell ya! Oooh mama those drinks are stiff. I don't know about you but normally when I order a piña colada (even with an extra shooter!) it's never quite that strong. Not complaining! It was delicious and we had a blast. I mean really - who doesn't love sipping a cold frozen cocktail while you stare at the waves crashing in? It made this beach lovin' babe happy as a clam 🦀. To answer your question, yes this is as good as it looks. And yes, you have got to grab a six pack of this stuff the next time you're down on the Emerald Coast. In the summer, my cocktail of choice when I'm at the lake or relaxing by the beach is always rosé (sometimes in a Tervis tumbler & sometimes in can). That being said, I inevitably grabbed this to try and I'm so glad I did. It is a beer and not just the classic rosé in a can but my, oh my is it delicious 😋. A trip isn't complete without a special little Sunday brunch, #amirite!? I'll be honest with you all - I can be a little picky about my brunch 🙈. I mean hey! If we're gonna do Sunday brunch, we better do it up right. Crackings. in Grayton Beach did not disappoint 🤤. To be a little more honest, just looking at these photos has me drooling all over again. It wasn't just me that felt that strongly about this meal! Lol. My friend Jamie got the Daybreak Scramble and said it was the best omelet she's ever had. I repeat - the best omelet she's ever had. If that's not a good enough reason to hop on over, I'm not sure what is 🤷. One of my requests to the girls while we were there was a visit to The Pearl over in Rosemary Beach (you can find it tucked away off of 30A). Although it rained on us a bit while we were there, I loved taking in the scenery. It was just my luck that on that particular afternoon they were having a special for $5 frosé. Is that a great deal or is that a great deal?? My oh my. They were absolutely delicious and so was the atmosphere there! I definitely recommend making a pit stop there on your next vaca. Just a little snippet of the walkways in Rosemary Beach 😍. By the recommendation of a couple friends, our last stop was at Firefly. This did not disappoint. I'll be honest, I was a little worried when we pulled in to a strip mall for this restaurant. After I took one step inside, I knew I had (wrongly) judged a book by it's cover. They have quite a fabulous lounge area where you can enjoy a cocktail while waiting for your table. An absolutely wonderful way to start your evening! While the lounge area is a great entry, it doesn't hold a candle to the main dining room. There is a large tree lit with tree lights to add an extra touch to the overall atmosphere. While the atmosphere is delightful, the food stands strong next to that. As a sushi fanatic, I can attest to the fact that they know what they're doing. Their sushi rolls were all unique filled with a wide array of ingredients. From the look of the menu, there is truly something for everyone! This is a must stop on your next trip in Panama City. That about does it, dolls! Hopefully this post helps you kick start your next venture down to the Emerald Coast. This destination will leave you feeling fulfilled (with good eats and memories) and sun kissed skin!